Within Marvel Comics, most tales take place within the fictional Marvel Universe, which in turn is part of a larger multiverse. Starting with issues of Captain Britain, the main continuity in which most Marvel storylines take place was designated Earth-616, and the multiverse was established as being protected by Merlyn. Each universe has a Captain Britain designated to protect its version of the British Isles. These protectors are collectively known as the Captain Britain Corps. This numerical notation was continued in the series Excalibur and other titles. Each universe of the Multiverse in Marvel also appears to be defended by a Sorcerer Supreme at nearly all times, appointed by the mystic trinity of Vishanti to defend the world against threats primarily magical in nature from within and beyond and bearing the Eye of Agamotto. A funny animal is an anthropomorphic animal character who lives like a human. Funny animals typically are bipedal, wear clothes, live in houses, drive and ride vehicles, and have jobs or may even be recognized citizens of countries, which distinguish them from other animal characters who may nonetheless display anthropomorphic characteristics such as speaking or showing facial expressions. Funny animal is also the genre of comics and animated cartoons which primarily feature funny animals. Spider-Ham is a fictional character appearing in American comic books published by Marvel Comics. The character is an anthropomorphic funny animal parody of Spider-Man, and was created by Tom DeFalco and Mark Armstrong. Spider-Man 2099 is a fictional superhero appearing in American comic books published by Marvel Comics. The character was created by Peter David and Rick Leonardi in 1992 for Marvel's Marvel 2099 comic book line, and is a futuristic re-imagining of his namesake created by Stan Lee and Steve Ditko. In the fictional Marvel Comics multiverse, Earth-616 is the primary continuity in which most Marvel Comics titles take place. Battleworld is a fictional patchwork planet appearing in American comic books published by Marvel Comics. Alexander Joseph "Lex" Luthor is a fictional supervillain appearing in publications by the publisher DC Comics. The character was created by Jerry Siegel and Joe Shuster. Lex Luthor first appeared in Action Comics #23 and has since endured as the archenemy of Superman. The Parasite is the name of several supervillains appearing in American comic books published by DC Comics. Each version of the character has the ability to temporarily absorb the life-energy, superpowers, and knowledge of their victim. The Spider is an alternative version of Spider-Man who merged with the Carnage-symbiote and has become a psychopathic killer. Before being displaced in time, he had been on death row in his home reality. He originates from Earth-15 and was a member of Weapon X.
Spider-Man: The Manga is a Japanese manga illustrated by Ryoichi Ikegami which retold the story of Spider-Man in a Japanese setting. It was originally published in Japan from January 1970 to September 1971 in Monthly Shōnen Magazine. The main character is named Yu Komori(小森ユウ,Komori Yū) to maintain the Japanese adaptation. Warren Ellis' parody of Kurt Busiek's Marvels , Ruins , was a two-part miniseries set in an alternative universe where the situations that led to the heroes of the Marvel Universe gaining superpowers instead led to the more realistic side effects of horrific deformities and deaths. In this world, when Parker was bitten by a radioactive spider, instead of gaining powers, he broke out into an infectious rash that covered his body before his painful death. He had visited the offices of the Daily Bugle beforehand and infected fellow photographer Phil Sheldon, who set off to figure out how his world took a wrong turn, but succumbed to the disease before he could write his book. He is a playable character in the video games Spider-Man Shattered Dimensions and Spider-Man: Edge of Time , with Edge of Time seeing him pitted against a psychotic version of Peter Parker in 2099, this Peter having become the CEO of Alchemax and attempting to rewrite the universe to fit his vision. CEO Peter uses an elaborate spider-based robot in his fight against Miguel, but Miguel is able to defeat him by using the tentacles of Atrocity- a twisted hybrid of Anti-Venom, Doctor Octopus, and Alchemax employee Walker Sloan- to weaken CEO Peter's powers. He is a playable character in Lego Marvel Super Heroes 2. This is a satirical version of mainstream Spider-Man in Not Brand Echh . Alternative versions of Spider-Man appear in several issues of What If..? . In one major alternative universe Spider-Man joins the Fantastic Four;  this universe is revisited in several different issues of What If..? During the Spider-Verse storyline, this version of Reed, Ben, Johnny, and Peter are killed by Karn. What if Spider-Man had never become a crimefighter explores a world where Spider-Man stopped the burglar from robbing the TV studio and continued his television career, becoming a public relations 'specialist' for superheroes until Jameson's angry attack on him for slacking off with his powers nearly results in Daredevil's death, inspiring Spider-Man to become a real hero. This version of Spider-Man is seen in Spider-Verse and apparently survived. In a different version of Spider-Island , Spider-Man was supposedly killed by the spider-infected Avengers which inspired Agent Venom to lead the resistance. However, he is discovered to be alive and captive in the Spider Queen's facility. He aids Flash to stop the Spider Queen and becomes the Baron of Spider-Island after she is defeated at the cost of Flash's life. In Amazing Spider-Man: Renew Your Vows, a story that has Spider-Man and Mary Jane married with a daughter named Annie (who is developing Spider powers of her own). After being glimpsed at in the Spider-Verse storyline,  Peter saves his family from Venom while most of the heroes die to Regent. He retires as Spider-Man to avoid detection from Regent and to focus on raising his family. However, he is later forced to don the mask again to stop Regent and protect his family. 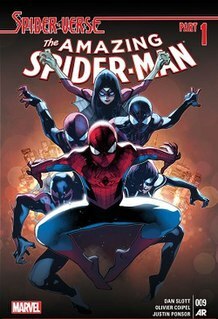 The second volume of the comic series details the later adventures of Spider-Man and his family. In the Marvel Cinematic Universe film series (Earth-199999), Spider-Man is played by English actor Tom Holland and makes his debut appearance in Captain America: Civil War . Peter Parker first appeared as a child in Iron Man 2 , who wore an Iron Man mask and glove and is saved by Iron Man while trying to "battle" the Justin Hammer's robots gone rogue. Parker was played by Max Favreau, the son of the film's director and portrayer of Happy Hogan, Jon Favreau. He next stars in his first solo movie Spider-Man: Homecoming , where he is mentored and monitored by Stark through the latter's chauffeur Happy Hogan (who is annoyed by him so much that the latter neglects his duty), while balancing his high school life with his vigilantism. He later stumbles on a group of smugglers and criminals stealing Chitauri technology left in the event of Avengers and were led by the mysterious Vulture, who is revealed to be the father of his high school crush and Decathlon leader Liz Allan and goes on a quest to defeat them to prove his mettle to Stark and his worthiness of being an Avenger which he dreams of becoming. However, after defeating Vulture, he declines Stark's offer of membership and decides to be a friendly-neighbourhood Spider-Man instead. Parker then returns in Avengers: Infinity War , he first appears in a school bus being alerted to Thanos' invasion and sets out to investigate and ends up saving Iron Man from Cull Obsidian. He later joins Stark much to the latter's chagrin in rescuing an abducted Doctor Strange from Ebony Maw, receiving the Iron Spider Armor made for him by Stark the previous year when he rejected Stark's offer in order to survive outer space. The two later kill Maw by ejecting him out of his ship into deep space and free Strange following which Parker is knighted an Avenger by Stark much to his delight. The trio head to Titan to confront Thanos where they are joined by several members of the Guardians of the Galaxy in combating the Mad Titan after an initial misunderstanding, but the heroes are ultimately defeated and upon Thanos snapping his fingers with a completed Infinity Gauntlet in Wakanda, Parker along with Strange and the Guardians (except Nebula) are reduced to dust alongside half of the universe with Parker being the last person on the planet to vanish, fading away in Stark's arms. Parker is expected to return in the upcoming Avengers: Endgame and Spider-Man: Far From Home . There are many other versions of Spider-Man outside of comic books. Some in film, in television or in video games among countless other media. 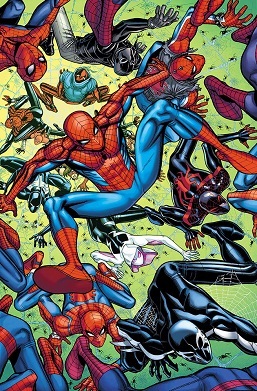 Some characters have crossed over in the comic book canon as one of the separate incarnations such as the Ultimate Spider-Man animated series version and the live-action Japanese show version appearing in Spider-Verse . Also, one of the alternate Spider-Men from the series final of the '90s TV show appeared in Spider-Verse as a background character, and the two live-action versions from the original trilogy and Amazing Spider-Man series are mentioned. Gwendolyne Maxine "Gwen" Stacy is a fictional character who appears in American comic books published by Marvel Comics, usually as a supporting character in those featuring Spider-Man. A college student, she was a romantic interest for Peter Parker. Carnage is a fictional supervillain appearing in American comic books published by Marvel Comics. The character first appeared in The Amazing Spider-Man #360. Carnage was created by writer David Michelinie and artist Mark Bagley. The character belongs to a race of amorphous extraterrestrial parasites known as the Symbiotes. The symbiote is usually depicted as an offspring of Venom. The symbiote has taken many hosts. The original and most notable host is serial killer Cletus Kasady. Other hosts include Karl Malus and Norman Osborn. Harry Osborn is a fictional character in the Marvel Comics Universe. 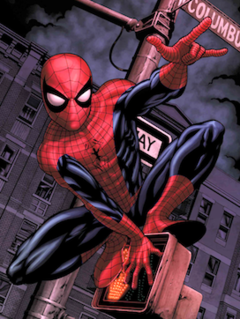 The character first appeared in The Amazing Spider-Man #31, and was created by Stan Lee and Steve Ditko. He is Peter Parker's best friend, the son of Norman Osborn, the father of Normie Osborn and Stanley Osborn, and the second incarnation of Green Goblin. The Jackal is a fictional character, a supervillain appearing in American comic books published by Marvel Comics, commonly depicted as an enemy of Spider-Man. There are two incarnations of the character: the first and most well-known is Miles Warren, while the second, Ben Reilly, later returns to his previous persona of the Scarlet Spider. George Stacy is a supporting character in Marvel Comics's Spider-Man series. He is Gwen Stacy's father, and a strong supporter of Spider-Man often defending the superhero when others accuse. Ezekiel Sims is a fictional character appearing in American comic books published by Marvel Comics, usually as a supporting character in stories featuring Spider-Man. The Symbiotes are a fictional species of organic, amorphous, multicellular, extraterrestrial symbiotes appearing in American comic books published by Marvel Comics. The Klyntar bond with their hosts, creating a symbiotic bond through which a single entity is created. They also are able to slightly alter their hosts' personalities, by influencing their darkest desires and wants, along with amplifying their physical and emotional traits and personality, granting them super-human abilities. 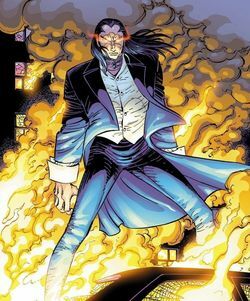 Morlun is a fictional supervillain appearing in American comic books published by Marvel Comics. The character is a central foe of all the themed versions of Spider-Man, being one of their most powerful and dangerous adversaries. He is an entity from Earth-001 that hunts all the Spider-Totems from traveling to the many multiverses of Marvel Comics. He is best known as the temporary killer of the Earth-616 version of Spider-Man in the storyline "Spider-Man: The Other", and is also the main antagonist of the "Spider-Verse" storyline where he and his estranged family attempt to kill all the versions of Spider-Man as prophesied by him. Spider-Man is a fictional superhero appearing in American comic books published by Marvel Comics. He is an alternate version of Spider-Man, a character first created by Stan Lee and Steve Ditko in 1962. The Ultimate version of the character originated in Ultimate Marvel, a line of books created in 2000 that are set in a parallel universe with a narrative continuity separate and independent from the main continuity of Marvel Comics stories that began in the 1960s. 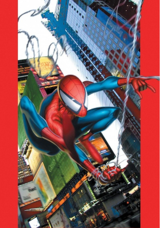 Ultimate Spider-Man, the first and flagship title of the Ultimate line, was created by writer Brian Michael Bendis and artist Mark Bagley, and debuted with Ultimate Spider-Man #1, which featured the first appearance of the Ultimate version of the character. The biggest difference is this version of Parker is killed at the age 16, only having one year of Spider-Man under his belt. Mary Jane Watson, often shortened to MJ, is a fiction supporting character originally appearing in Marvel comic book as the best friend, love interest, and wife of Peter Parker, the alter ego of Spider-Man. She was created by writer Stan Lee and artist John Romita, Sr. She has appeared in multiple spin-offs, alternative realities, and dramatizations of the Spider-Man titles. "Spider-Verse" is a 2014 comic book storyline published by Marvel Comics. It features multiple alternative versions of Spider-Man that had appeared in various media, all under attack by Morlun and his family, the Inheritors. The last two episodes of Spider-Man: The Animated Series (Spider-Wars) about multiple Spider-Men going across dimensions fighting villains, served as inspiration for Spider-Verse. 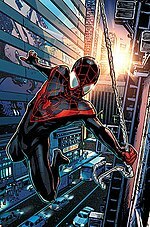 Beginning in August 2014, the event was preceded by two new issues of the cancelled Superior Spider-Man, issues of Spider-Man 2099 and a five issue run of one shots-all under the Edge of Spider-Verse banner. Spider-Gwen is a comic book series published by Marvel Comics that began February 2015. The series revolves around the Gwen Stacy of Earth-65, an alternate Earth that debuted in Edge of Spider-Verse #2 as part of the 2014–2015 Spider-Man storyline "Spider-Verse". Spider-Gwen explores a universe where Gwen Stacy was bitten by the radioactive spider instead of Peter Parker, forcing her into a career as the Spider-Woman of her world, Earth 65. Spider-UK is a British-based Spider-Man appearing in Marvel Comics. He is notable for being of one of the lead characters in "Spider-Verse" storyline and is the leader of the Web Warriors. 1 2 3 4 Spider-Geddon #5. Marvel Comics. ↑ "Spectacular Spider-Man Adventures". Grand Comics Database. Archived from the original on 15 November 2013. Retrieved 10 July 2013. ↑ "Marvel Promises Some 'Wild Things' From EDGE OF SPIDER-VERSE". Newsarama. 12 June 2014. Archived from the original on 15 June 2014. Retrieved 30 June 2014. ↑ Peter David. Friendly Neighborhood Spider-Man #9. Marvel Comics. ↑ Peter David. Friendly Neighborhood Spider-Man #10. Marvel Comics. ↑ Peter David. Friendly Neighborhood Spider-Man #13. Marvel Comics. ↑ C.B. Cebulski. Spider-Man: Fairy Tales #2. Marvel Comics. ↑ C.B. Cebulski. Spider-Man: Fairy Tales #3. Marvel Comics. ↑ C.B. Cebulski. Spider-Man: Fairy Tales #4. Marvel Comics. ↑ Amazing Spider-Man Annual #38. Marvel Comics. ↑ Incredible Hulks Annual #1. Marvel Comics. ↑ Punisher Kills The Marvel Universe (November 1995). ↑ Edge of Spider-Geddon #3. Marvel Comics. ↑ Edge of Spider-Geddon #4. Marvel Comics. ↑ Insomniac Games (September 2018). Marvel's Spider-Man . Playstation 4. Sony Interactive Entertainment. You do what you think is best, Doc. It's all any of us can... even when it hurts like hell. 1 2 3 Vault of Spiders #1. Marvel Comics. 1 2 Spider-Geddon #3. Marvel Comics. ↑ Spider-Geddon #2. Marvel Comics. ↑ Spider-Geddon Ghost Spider. Marvel Comics. ↑ Spider-Geddon #4. Marvel Comics. ↑ Edge of Venomverse #3. Marvel Comics.